TOP EIGHT — Earning top places in the Boone County Spelling Bee on Jan. 30 were (front, l.-r.) first place Zach Panther of St. Edward, second place Grace Tibor of St. Edward, third place Josh Erickson of St. Michael’s, fourth place Sadie Baldwin of Riverside; (back, l.-r.) fifth place (three-way tie) Kaden Wemhoff of Riverside, Nathan Devine of Boone Central, Clay Sandman of Boone Central, and sixth place Malaina Francis of St. Edward. 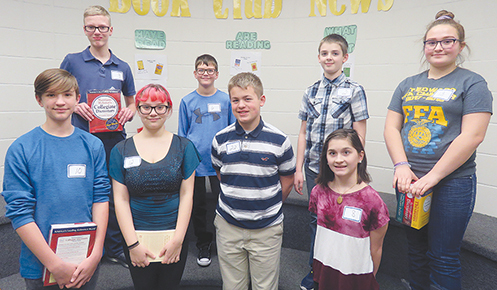 The frigid weather didn’t stop area spellers from attending the annual Boone County Spelling Bee last Wednesday, Jan. 30, at Boone Central Schools. St. Edward seventh grader Zach Panther, son of Justy Riggs-Panther and Brad Panther, was named champion at the event. Zach had tied for second place in the contest last year as a sixth grader. In total, there were 35 middle school contestants, representing all Boone County schools, who participated in the competition. Students spelled out 100 words during the event. There were eight finalists who advanced to the oral rounds. Grace Tibor, eighth grader from St. Edward, placed second and Josh Erickson, seventh grader from St. Michael’s, came in third. Fourth place was Sadie Baldwin, seventh grader from Riverside. Tying for fifth place was Kaden Wemhoff, seventh grader from Riverside; Nathan Devine, seventh grader from Boone Central; and Clay Sandman, sixth grader from Boone Central. Malaina Francis, eighth grader from St. Edward, placed sixth.